AGAINST A FRESHLY minted logo and emerald green backdrop, An Post CEO David McRedmond announced that Wednesday was a “momentous day” for the postal service provider. As part of a pitch to appeal to a younger and online-savvy clientele, the company offically unveiled a new pared-back logo and teal-based colour scheme in the green glow of a GPO conference room. It’s no secret that An Post has been undergoing significant change over the last two years, with regular announcements on its finance services and new delivery platforms. The company had a bit of a rough ride in recent years, with the internet hijacking the humble letter and competitors mooching in on its delivery territory. But with a shiny new image and healthier finances, An Post is eager to make itself more relevant to the coveted millennial market. “We’ve got the economics of the business sorted out,” said chief financial officer Peter Quinn, in what turned out to be a series of ‘bold’ statements and moves announced during a 40 minute-long presentation. On the back of a €12.4 million loss in 2016, the company clawed its way back to the black in 2017, declaring an €8.4 million profit. It is now looking at a €40 million operating profit for the end of 2018. This is on the back of a major cost-cutting regime that has seen the company shutter post offices across the country and put its thinking cap on to repurpose a number of unused properties. Over the coming months, the company will be investing in digitising more services, introducing automated parcel delivery – and rolling out Parcel Motel-style delivery lockers. As part of its reboot, An Post last year undertook market research “to better understand consumers”, especially those who don’t see its services as relevant, said Debbie Byrne, who is managing director of An Post’s retail offshoot. The renewed An Post is catering to a fictional character called Ciara, a smiling, red-haired colleen who embodies the decades-old company’s new target audience. “Ciara lives her life online as you would expect. Interestingly, she’s socially conscious and this is a big trend among millennials. This cohort of customers is looking to align themselves with brands that share their values,” Byrne said. Like many stereotypical millennials, Ciara is “time poor, she’s looking to maximise her resources, she’s ambitious in her career and looking to get on in her life … and she wants that on her terms”, according to Byrne. With tech-savvy millennials in mind, An Post is hoping to “act for the common good”, and plans to be emission-free within the Dublin canals by the end of this year and the rest of the country by 2030. Over the coming weeks, it will also announce a new initiative called ‘Address Point’ providing surrogate addresses for people who are homeless. 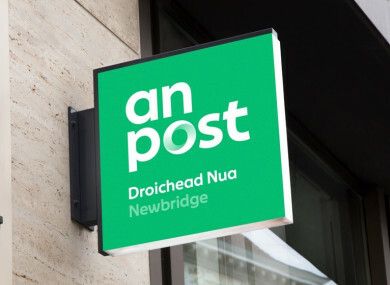 The main difference between the old logo and the new one – which will cost €5 million to deploy over three years – is the absence of An Post’s iconic “wavy lines”, which represented the old franking marks. This shows the company is “breaking with the past”, said Byrne. “We’ve refreshed our green to make it more modern for the digital age and for a younger consumer,” she added, but noted that the company kept some ‘Celtic type’ to borrow from the past. As part of its new outlook, the postal service provider also announced two new sub-brands: An Post Money, which brings together its various finance services like personal loans and credit cards, and An Post Commerce, a business-to-business brand providing e-commerce and mailing services. Email “How An Post enlisted a fictional, time-poor millennial to create its fancy €5m logo”. Feedback on “How An Post enlisted a fictional, time-poor millennial to create its fancy €5m logo”.